The 2018 PostEurop Plenary Assembly and 25th Anniversary celebration dinner will be held in the beautiful capital city of Georgia - Tbilisi, hosted by Georgian Post. In an interview with Mr. Levan Chikvaidze, CEO of Georgian Post, PostEurop had the opportunity to get to know more about its recent developments. PostEurop: Mr. Chikvaidze, PostEurop is honoured that Georgian Post is hosting our Plenary Assembly on the occasion of our 25th Anniversary. Can you tell our readers about Tbilisi and why Georgian Post is hosting this event? LC: It is indeed a pleasure and an honour to host PostEurop's 25th Anniversary Plenary Assembly here, in Georgia. It is a great occasion for bringing the wider community together to discuss a broad range of issues in the postal industry. The event is also an excellent opportunity for our guests to get acquainted with our country, its culture, history and people. The plenary will be held in our capital Tbilisi, one of the oldest city in Georgia, founded in the 5th century AD. The name Tbili or Tbilisi (literally, "warm location") was given to the city because of the area's numerous sulphuric hot springs. The name also perfectly reflects the welcoming nature of the town and its warm-hearted inhabitants. It has been home to people of multiple culture, ethnic, and religious backgrounds. Tbilisi is a gem between Europe and Asia, a place you will not regret visiting. Why is the Georgian Post is hosting this event? I use to say that the city of Tbilisi has a soul. It revives legends, makes you feel the history and culture in just one deep breath. I have personally very much enjoyed every single hosting country of a PostEurop plenary assembly and now I want my precious colleagues to come and feel the Georgian soul. We all are extremely excited at the chance to host representatives of designated operators, especially those who has been doing a lot for Georgian Post since its adhesion to PostEurop. PostEurop: As an active member of PostEurop, can you tell us how PostEurop brought value to your organisation? LC: PostEurop adds value to its members by functioning as a collaborative platform, where they can exchange information on cooperation, communication, and innovation. This platform enables its members to share best practices, develop activities which identify solutions to common challenges which face the postal industry today. Names like Jean-Paul Forceville, Botond Szebeny, Jürgen Lohmeyer, Maire Lodi are widely known as the big supporters of Georgian Post. The role of PostEurop in our growth and development is highly appreciated. We believe that being a part of PostEurop is a step forward towards the Georgia's strong aspiration to become one day a member of the European Family. We might not change the entire world, but each of us could play its own role for a prosperous future. PostEurop: We have been reading a lot about the transformation of Georgian Post. Can you tell us more about the transformation and the role you played? What were the greatest achievements from the transformation? LC: Georgian Post has been going through the drastic transformation from a demolished and devastated entity towards a modern and diversified establishment, whose long-standing mission is to provide universal service to all citizens. We developed and implemented add value postal products, like an express mail, e-commerce, new logistic schemes, which gave us the possibility to finance the Universal Service. Today, Georgian Post has a country-wide network for the collection and distribution of mail and other postal items in place. The start of the developmental process matches the time we joined PostEurop. The major issue was the business model of the company. We could not rely on indirect small amounts of subsidies from the State budget (in 2013 the government refused to continue financing the company), in this drastically dynamic digital era, we needed quick changes, change agents in team, sufficient infrastructure and knowledge of postal specific aspects. In leading this company, I’ve pooled our strength and we have worked together to serve the best interests of the company and our customers. It is my firm belief that I was at my best when I harness the collective talents of all “change agents” and the management of the company together with those whom I have the privilege to share the council table with. We were wise enough to divide ourselves up into two formal teams, the first small team that handled the crisis and a second considerably larger team, which made sure that we were there for our customers. Both teams worked around the clock seven days a week. It was tough, difficult and sometimes really horrible when unpredictable things happened. It was at that exact time when the UPU foundation and PostEurop experts took an interest in what we were doing and gave us actual modelling tools and many recommendations. Since then the wheels begun to roll. I am very thankful to my patient colleagues in the executive management team who have challenged me and so clearly demonstrated the power of a group, and to all 2,900 employees for their warm and lovely hearts. PostEurop: Looking forward, what would you say are the key challenges for Georgian Post and for other postal operators in general? How do you foresee the future the company? LC: Georgian Post must become a modern, well-functioning company, with high quality services and a wide range of customers-oriented products. The main focus include modernisation, improvement of the IT infrastructure quality level, improvement of the employees’ conditions and of services provided to the general public, concentrating more on the range of services that are profitable. We have a long-term ambition to forge a new and modern business model for an institution that has served this country and evolved with changing times since 1805. I am not good at predictions. I can’t predict far future in this technological era, after 20 or 30 years we might bring products closer to market by using the 3D printer, we might have a virtual access to each other’s minds, or letter mail and an e-mail might no longer be in use, but nowadays the problem remains in logistics. I remain on my position that we all need to consolidate our efforts to simplify logistics. PostEurop: At the Business Innovation Forum, we have the opportunity to listen to how Start-ups can bring real Innovative solutions to postal operators. How do you view this approach and are there plans to work with start-ups even outside of Georgia? LC: We are excited to learn about what start-ups can bring to the postal value chain. Looking at the agenda of the PostEurop Business Innovation Forum, we are excited and confident that Georgian Post will have the opportunity to find new and innovative ways of developing our activities, especially in the mail and parcel areas which will strengthen our universal service and corresponds to our customer needs. PostEurop: Thank you so much Mr. Chikvaidze for this great opportunity to get to know you and your organisation. We very much look forward to a successful event in October. Mr. Levan Chikvaidze was appointed as the Director General of the “Georgian Post” LTD on 19 November 2012. 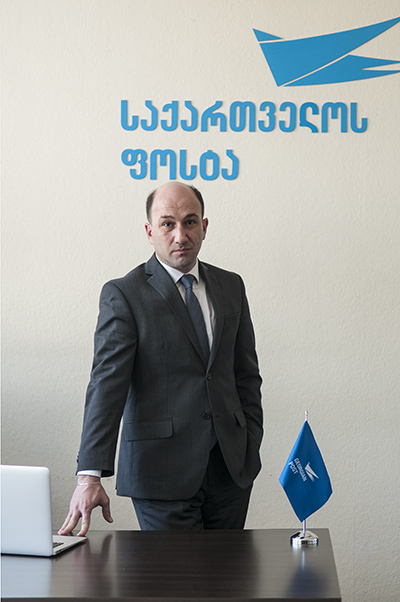 Mr. Levan Chikvaidze was born on 9 January 1973. He began his career as the Assistant to the Nadzaladevi District Governor, Tbilisi, Georgia in 1996 and worked till 1999. He continued his work as the Head of International Relations Group in the Parliament of Georgia from 2000-2002. In 2003 Mr. Chikvaidze was appointed the Vice-Mayor of Rustavi city, Georgia and completed his mission in 2005. From 2006 to 2007 he was CEO of “Greco Group”, one of the first American investment companies in Georgia. From 2008 till 2009 he worked for Cell Gate USA as a Network Engineer in Irvine, California. From 2010 till 2012 he worked at MTC Inc. in the Sales Department in New York City, NY. In 2012 he joined the Voters League as an Executive Director in Tbilisi, Georgia. Mr. Levan Chikvaidze studied Engineering at the Georgian Technical University from 1989-1994. From 1999-2002 he studied at the Tbilisi State University. In 2005 he completed a special education course in Micro and Medium Business Development at the International Cooperation Centre of the Ministry of Foreign Affairs in Israel. In 2007 Mr. Chikvaidze completed a special education course at the ConocoPhillips Business Administration, Los Angeles, California.